There was no moon in the early hours of January 17, 1991…and nothing in the trip-wire of the elaborate, high-tech Iraqi air defense system. The radar screens were empty. Unseen, undetected, unexpected, two flights of F-117A Stealth aircraft appeared (or, rather, didn't appear) over Baghdad, dropped sixty tons of deadly munitions on high-value assets (in a scene replayed again and again on TV, a laser-guided GBU-10 "Pave Way" 2,000-pound bomb disappeared down an airshaft atop the ten-story headquarters of the Iraqi Air Force and penetrated to the basement before it detonated), turned for home, and were long gone by the time the night sky lit up in a firestorm of AAA tracers. In the most indelible image of the Gulf War, the Iraqis were shooting at ghosts. 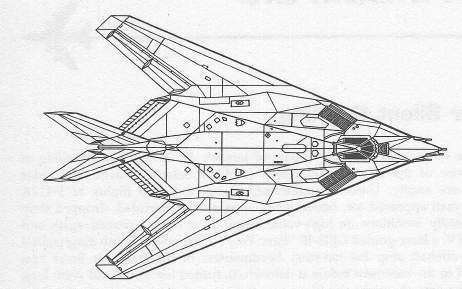 In fact, for the remainder of the war, F-117As were the only aircraft to attack Baghdad directly. They all returned without so much as a scratch. The contingent of thirty-six Nighthawks stationed at Khamis Mushayt in southwest Saudi Arabia (the farthest air base from the Kuwait/Iraq border) flew only 2.5 percent of Coalition air strikes, yet accounted for 37 percent of the targets destroyed—a remarkable record. Welcome to the future of airborne warfare. Like submarines, stealth aircraft "run silent, run deep," operating only at night, so quiet on "whisper cruise" that they can't be heard two hundred feet overhead, and so invisible to radar they have trouble landing at friendly air bases: the tower has to clear all other traffic and talk them down until their running lights are visible (even with radar "reflectors" deployed, they barely show up on the ATC's 'scopes). The F-117A, the best-kept secret of Lockheed's fabled "skunk works" since the awesome SR-71 spy plane, is one of the most unusual shapes ever to take to the air. Technically, the "Wobbly Goblin" (like the F-16, its flight path is controlled by computer, not directly by the pilot) isn't even an airplane, it's a "lifting body," like the Space Shuttle. Its triangular pyramids-and-crystals outline is comprised of only three dozen radar-absorbent facets, each angled to reduce the radar return (or reflected signal strength, as read by a radar "gun" like those used by state troopers; if you had a car designed like this, you'd never get a ticket). It has all the aerodynamic stability (in Tom Wolfe's immortal description) of a ring of house keys tossed in the air.